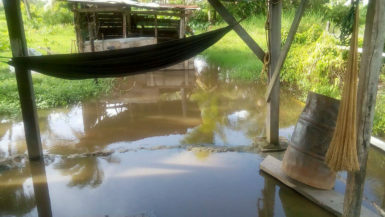 Poor drainage in Lima on the Essequibo Coast has contributed to flooding in the area resulting in the loss of livestock, a resident has said. Speaking with Stabroek News yesterday, Lima resident Gulzaira Nandalall related that the area was recently flooded due to the heavy rainfall. He explained that the problem is a long-standing one as there is only one outlet to discharge water out of the area. Further, the situation has been made worse as farmers release water from their rice fields. A glimpse of the floodwaters under Gulzaira Nandalall’s home. The murky floodwaters affecting residents of Lima, Essequibo Coast. Nandalall pointed out that the community is a short distance away from large rice fields and when farmers decide to discharge water from their farmlands, the water level in the trenches rises to a point where it overflows, resulting in flooding. He said that reports have been made continuously to the Regional Democratic Council but nothing has been done to rectify the situation. “All they do is come to the area to check the culvert and say they will look into the problem when the dry season comes but the dry season was here and nothing was done. Now when we raise the issue again, they tell us that nothing can be done because the place is too wet,” Nandalall lamented. He said even when it does not rain, the water takes almost two weeks to recede. According to Nandalall, the last time he checked, the water level was three inches high. He said that the flooding has seen him losing some livestock while others have to pay high prices for sand to “build up” their land so they would not be affected by the water. 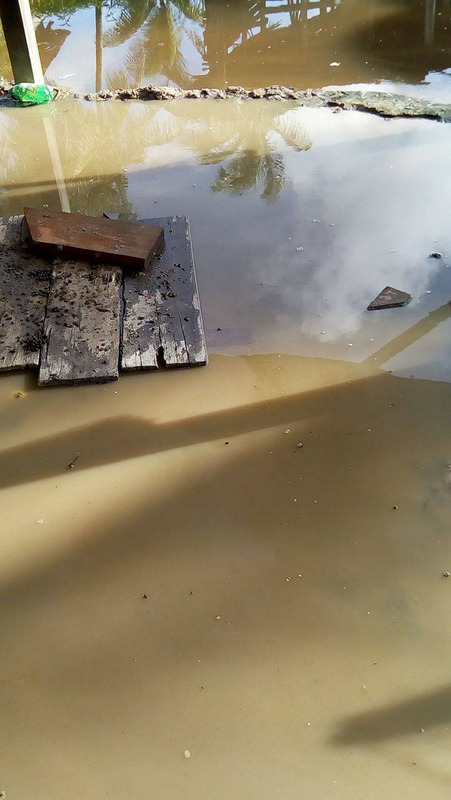 The man also said that residents have expressed concern about contracting mosquito-borne diseases such as dengue fever, Chikungunya and even Zika as a result of the floodwaters since this allows for increased breeding sites for the mosquitoes. “What is happening to us is very rough right now. We have to be very careful to avoid catching those diseases because of the floodwaters,” he said.